ALL good things must come to an end, but beaten Ross County will surely draw solace from the fact this long-forgotten losing feeling tarnishes, rather than trashes, their recent resurgence. It was, as Jim McIntyre later put it, a distinctly bad day at the office for the Staggies who, as opposite number Alan Archibald suggested, were beaten at their own game. The Maryhill visitors certainly set out to emulate Ross County’s earthier qualities in what was a monumental victory for Firhill survival hopes. 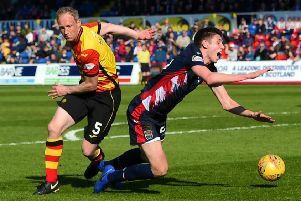 Another victory, the ninth from a wonderful unbeaten sequence since mid-February, would have pushed the once downtrodden Dingwall side to within 90 minutes of Premiership safety. Instead Partick sit one win from assured survival, with Archibald stressing: “We were up against a really good side today, one on a great run, so all credit to the lads for stopping that run. It was sunny and blustery, with a fiery pitch beneath, and County took the lead against the run of play. Rafa de Vita slipped a pass forward on the left flank to the over-lapping Jamie Reckord. The full-back feinted a return pass, instead crossing superbly right to the back of the box where Michael Gardyne was waiting to thrash in a deflected strike. Partick deservedly levelled after 26 minutes when Belgian defender Frederic Frans rasped a low 25-yard shot just inside Mark Brown’s right-hand post. Brown’s error brought the winner as he fumbled Stephen O’Donnell’s sharp-angled shot into the net. McIntyre, afterwards, didn’t shelter the experienced goalkeeper. Ross County: Brown; Fraser, Boyd, P Quinn, Reckord; Gardyne, Woods, Kiss (Cardle 77), De Vita (Dingwall 59); Curran (R Quinn 57), Boyce. Subs not used: Reguero, Palazuelos, Saunders, Sernas. Partick Thistle: Fox; O’Donnell, Frans, Balatoni, Booth; Higginbotham (Elliot 78), Osman, Bannigan, Lawless; Stevenson; Taylor (Doolan 82). Subs not used: Gallacher, Craigen, Richards-Everton, Fraser, Wilson.